Lenehans are famous for been a one stop shop for all things DIY. 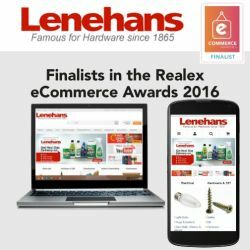 Now with the introduction of the www.lenehans.ie website you can now get over 16,000 DIY products delivered natiowide - Next Day ! In addition Lenehans are also famous for their range of Greenhouses. Having sold Greenhouses and Greenhouse accessories for decades, Lenehans are now one of the largest retailers of Greenhouses in Ireland. With over 40 models and 100s of different options, at https://www.lenehans.ie/ you'll find the right Greenhouse at the right price. Our website continues to grow from strength to strength. Our customers love us, simply because we stock such a wide range of DIY products at highly competitive prices and with super fast delivery guaranteed. So if your looking for a single screw, a box of 200, a Greenhouse or specialist cleaning products you'll find it online at https://www.lenehans.ie/. We're proud to say we've been in business for over 150 years. We're 100% Irish owned and operated, employing local people, supporting local companies and making shopping for DIY easy for thousands of people every week accross Ireland.